In Kettering, Ohio from December 26th to 28th. In Lake Orion, Michigan from December 23rd to 25th. In New York from December 19th to 22nd. In Houston, Texas from November 19th to 22nd. In Dallas, Texas from November 17th to 19th at Adams Golf and Sellinger's Power Golf. In Austin, Texas at Edel Golf. In Las Vegas, Los Angeles, San Diego, and Houston from September 22nd to October 9th. In Budapest, Hungary from September 8th to 11th. Gary McCord, Tom Watson, Jim McLean...I'm in some pretty good company here. Be sure to check out my new e-book...it’s Top 15 on Amazon.com golf e-books! 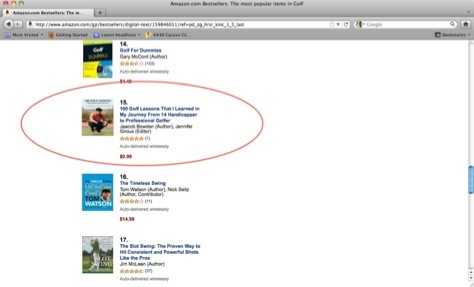 UPDATE: My “100 Golf Lessons” e-book has since reached #1 on the Best Seller List! In Crans Montana, Switzerland from June 16th to 19th. In Lake Orion, Michigan and Kettering, Ohio from April 3rd to 28th. In Marrakech, Morocco from March 3rd to 19th for a two-week teaching trip. In New York, Michigan, Ohio, and California from December 18th to February 7th.